How do kangaroos and other wildlife contribute to soil health, biodiversity, native grasses? WE HAVE COME to believe that ‘management’ of the environment is our right without question. However, lessons are sometimes learned too late until observation in retrospect. The devastation of Earth’s flora and fauna is fast becoming one of those ‘mismanagements’ that signal present and future problems. On ground observations of nature working together. Soils, either by water or wind erosion, make their way downhill. Various factors determine the erosive or beneficial containment of water passage. Whilst we conduct our lives with our focus, the natural order continues, long established with native residents, as described here. To our detriment we remove, by ‘management’ and killing, factors that have worked long before we entered the country. The environment needs to be understood far better than the concreting of whatever we can manage, and that includes our thinking processes and expedient judgements. Seemingly simple factors can make a marked difference on the environment. Consider soil structure. After heavy rains, earthworms (the ones who survive – some drown) and other soil dwellers forge upwards, seeking both passage to nutrition and ground cover above. They favour ground-hugging growth, and grasses and fibrous cover. Their upsurging tunnels aerate the soil and are so often seen next to kangaroo pellets (droppings), which provide both soil nutrition and fibre. Earthworms seek the surface near kangaroo pellets, seeking not only nutrition but also the fibre that remains on the gradual dissolution of kangaroo pellets, which happens over time, thus, with their tunnelling upwards, the earthworms and other micro-organisms aerate and loosen the soil structure, keeping it healthy. Following droughts and after rains, ground cover plants require nutritive elements to restore and to grow. 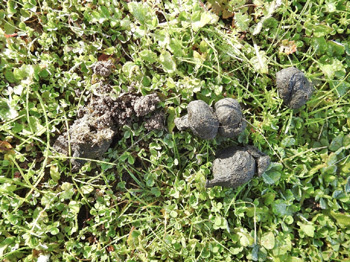 Both nutrition and fibre are available from kangaroo pellets, so often in the areas where it is most needed, including areas fenced off from introduced stock. On 22 July 2016 I placed 12 kangaroo pellets into each of four containers, covering with rainwater to simulate the effect of rain upon the pellets. They immediately began to release the nutrients and this continued until I strained them on 2 September 2016. The fibre that remained still beneficially held moisture after being drained. When observed in their natural environment, the pellets provide the surface fibre that contributes to soil structure and moisture retention, particularly at the base of plants in areas that most need it. Where washings/watersheds occur, there is often a cover of fallen eucalypt leaves, which are suppressive to growth [on a small block can be raked away]. As kangaroo droppings so often wash to the same areas, they assist plants’ renewal. Some native plants cannot tolerate artificial or foreign fertilisers. Kangaroo pellets consist of the very substances processed through their systems which benefit their surroundings. 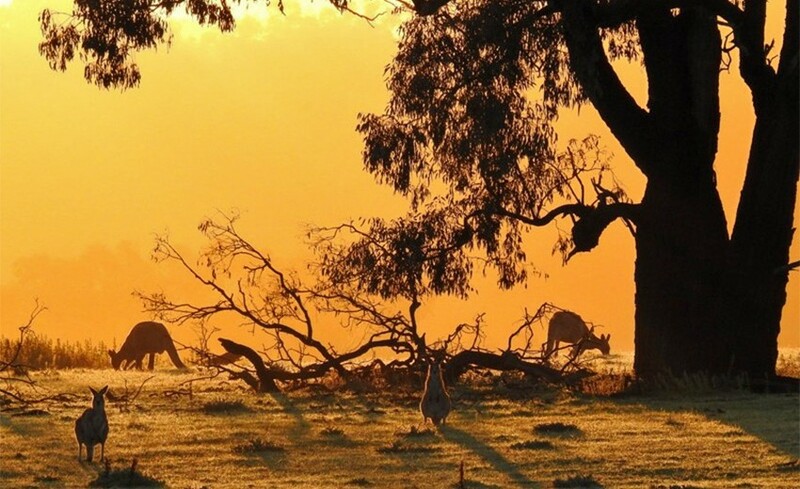 In thick frost, the time of greatest hunger, kangaroos graze the dried fronds of ‘nuisance’ (to farmers) clumps, whilst sheep graze already low pasture. In pasture areas, cockatoos and galahs gather to dig up the small bulbs that proliferate in season. As they dig, often on the kangaroo pellets, they provide entry for fertilising; for assisting the grasses in aeration; and seeding potential. We see natural systems at work. Birds, including cockatoos, galahs and corellas, gather to dig small bulbs (thus aerating the soil) that have been fertilised by kangaroo pellets (droppings). Native grasses have been recognized for their benefits – including survival in adverse conditions. While the prior emphasis has been on ‘pasture’, kangaroos access the areas often excluded and fertilise not only the native grasses, but all the plants which help to prevent erosion. They also fertilise the wildflowers and trees. Apiarists move their hives to take advantage of the flowering season. Honey production also provides a healthy bee population, essential to pollination and our food production. In the areas frequented for shelter by kangaroos, their pelleted droppings fertilise a wealth of wildflowers and provision for bees.